MSRP: $38.00 (Reboxed kit no. 35093 which includes a meathering set) My kit was a cheap $7.98 back in the 70’s when I bought it. The Soviet army was influenced by the German development and adoption of the assault gun. This type of vehicle entered German service in 1940 in time for the Western Front campaigning. By early 1940, the Soviets already had what they called an “artillery tank”, the KV-2 armed with a 152 mm L/20 howitzer in a massive box-like turret with all-around traverse. It had many limitations, however, which included a high silhouette, an inability to fire on the move, traversing limitations of the turret if the tank was on an incline, and a dramatic increase in weight compared with the ordinary KV-1 tank. The unsatisfactory nature of the KV-2 became evident in the opening stages of the German invasion of Russia in June 1941, when the KV-2’s were quickly overwhelmed by the German armor. The Soviets began to re-arm to meet the German armor on more equal terms. The famous T-34 was the most notable new vehicle and it rendered all German tanks then in service virtually obsolete. Self-propelled guns like the German “assault guns” were developed. One of the first was the SU-76, based on the chassis of the T-170 light tank. This appeared in 1942 and was intended initially as a tank destroyer. It proved to be too small and lightly armoured and was subsequently used as an infantry support weapon. Plans were put in hand to mount a 122 mm howitzer on the chassis and running gear of the T-34 to provide a replacement for the KV-2. A prototype was built in mid 1942. Stalin was greatly impressed and ordered immediate quantity production. By January 1943, the first regiment was equipped with the new vehicle designated SU-122. The new vehicle utilized an adapted M1938 122 mm field gun-howitzer mounted centrally on the front end of the T-34 hull. The turret was dispensed with and replaced by a low fixed superstructure. There was very limited traverse for the heavy weapon. The new superstructure took up all the space forward of the engine deck, and was distinguished by a well shaped front and a massive mantlet. A cupola for the vehicle commander was situated to the left front. The chassis used was the current 1942 T-34. A horn periscope and a radio were command aids on the SU-122. The frontal armor was up to 100 mm thick and there was a crew of four. As the SU-122 was available for supporting infantry it was decided that the SU-122 would provide fire support for the tank divisions. Platoons of three SU-122’s would be attached to tank companies or battalions. There was thus some divergence from original German ideas, for the SU-122 often became a substitute for a tank. In February 1943, production of the JU-122 ended in favor of the JSU-152, a similar vehicle based on the chassis of the KV or JS series tanks. It had a 152 mm gun. Tamiya is a prolific model company based in Shizuoka, Japan. The make all manner of model subjects in the popular scales. This kit came in a shrink wrapped tray and lid type box. 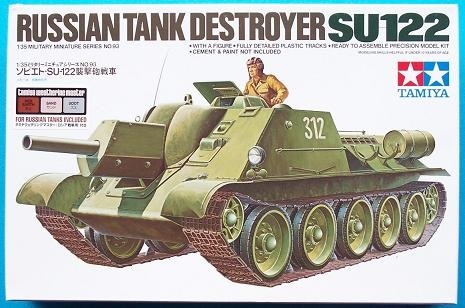 The box art shows a SU-122 posed against Tamiya’s usual signature all white background that they use on their kit box arts. It is overall Russian dark green with a white number 312 on the hull sides. A commander figures is looking out of the top hatch. 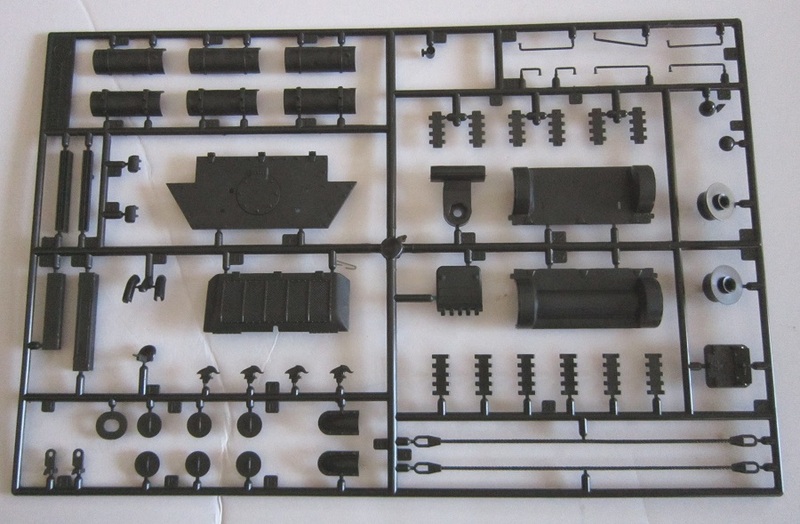 One side panel of the box has a small color repeat of the box art followed by a one-paragraph history of the SU-12, followed by a list of features of the kit: A plastic kit in 1/35th scale, the characteristic style is precisely reproduced and the 122 mm howitzer and heavy armor looks very powerful, rough casting and welds are realistically modeled, many accessory parts such as hand-rails, hatches etc., lend realism to your model, includes figure of Russian tank soldier. Tamiya’s street address in Shizuoka, Japan is provided. The other side panel has 3 color box arts of other AFV models that Tamiya markets: a Russian T-34 tank 1942 production model, a Russian GAZ-67B field car and a Russian SU-85 tank destroyer. No kit numbers for these are shown. Tamiya’s address in Japan is again given. The ends of the box have Model Rectifier Corp’s address in Edison, New Jersey provided. Model Rectifier was the importer of Tamiya kits back in the 70’s. The kit contains 4 very dark-green trees of parts in 2 stapled-shut cello bags and a loose very dark-green hull bottom and hull roof parts, steel colored vinyl rubber-band type tracks, a tree of black vinyl washers and hub caps, a screw, nut and metal rod in a stapled cello bag, the decal sheet and the instructions. The instructions consist of a single sheet that accordion-folds out into 6 pages in 7” x 11” page format. Page 1 of the instructions begins with a black and white repeat of the box art, followed by the history of the SU-122 in English and German. Page 2 has the parts trees illustrations with a listing to the side of the names of what the parts are. Some parts are shown shaded out in these illustrations as being excess and not needed to complete the model. Page 3 through 5 give a grand total of 9 assembly steps. The bottom of page 5 has a black and white photo of a T-34 and a SU-122 model made up and next to each other. Page 6 has the decal application instructions to the left side of the page, with four marking and painting options shown on the right side. The first scheme is in overall dark-green with a small red star followed by a black number 603 on the sides of the hull. No unit is mentioned. 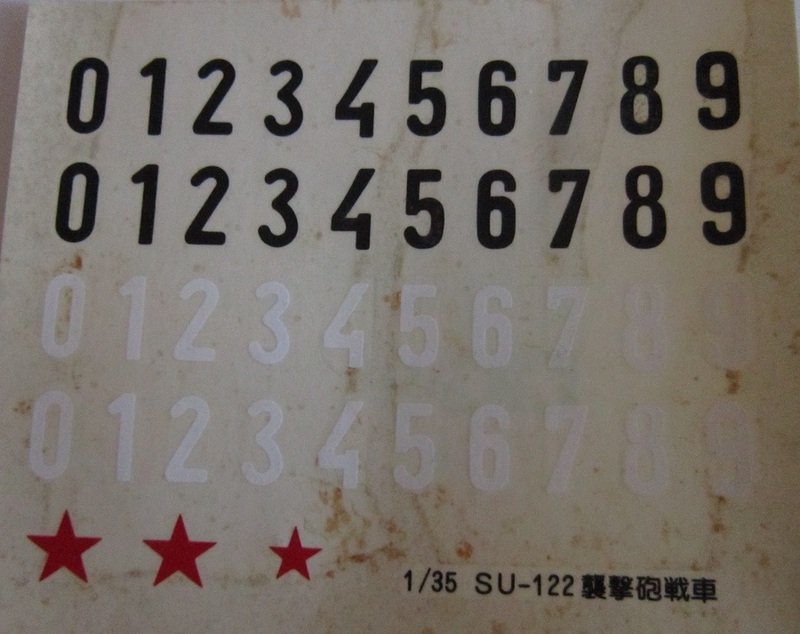 The second scheme is in overall winter white-wash with a small red star followed by a black number 418 on the sides. The third scheme is also in overall winter white-wash with a black number 320 on the sides. 4th Infantry Company. The fourth scheme is in a base of the dark-green with winter white-wash that is beginning to wash off and show the green below. It has the black number 319 on the sides. It belongs to the 4th Infantry Company also. Very dark-green letter A parts tree holds: the hull rear wall, engine air intake screens, exhaust shields, tow cables, spare track links, 3 external fuel drums, grab bars etc. (62 parts) 12 parts are shaded out in the parts trees illustrations as being excess. 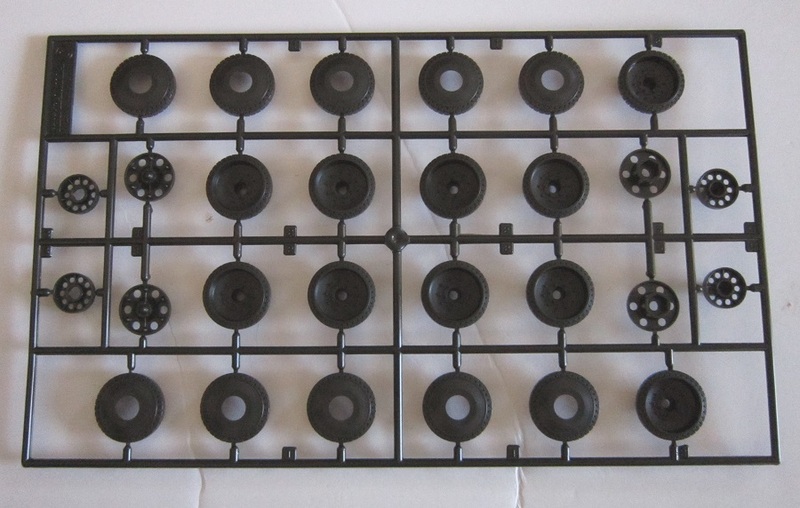 Black vinyl letter B parts tree holds washers and hub caps (20 parts) 4 parts are excess. Very dark-green letter E parts tree holds, a fourth external fuel drum parts and the fuel drum support brackets, the main gun and mantle, more grab handles etc. (the figure is divided into separate torso, lower body and arms) (26 parts) There is no clear part for the headlight lens and no interior parts. I intend to use one of my MV brand lenses. The decal sheet is badly yellowed with age and moisture in my basement got to it, creating some spots. Oh well, I have other markings in my decal file I can use. The steel colored vinyl treads are next. There are 2 tracks included and these have to be heat-welded into a loop and are not the newer glueable type. 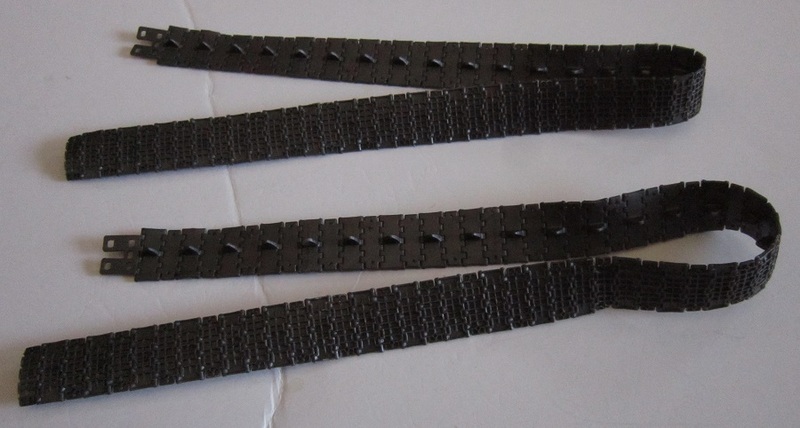 Tamiya suggests alternates of sewing the ends together or staple them. Not a chore I ever look forward to. This type of track always seems to want to part company later no matter what method you use. 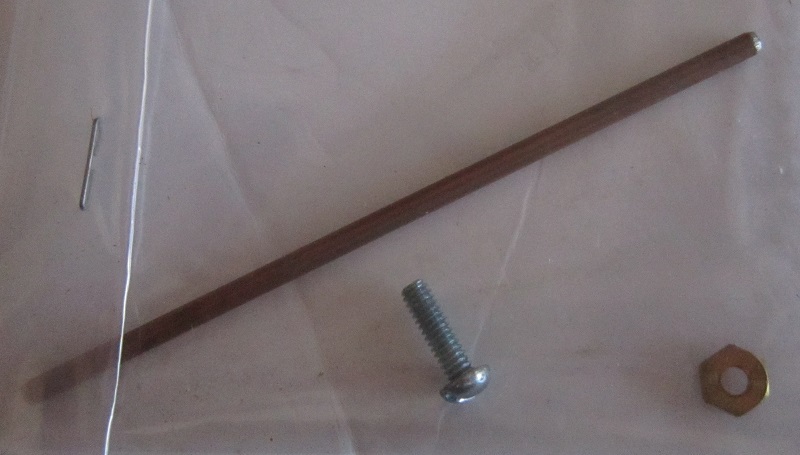 The steel rod, screw an nut are to be used to hold part no. A21 which has a yoke on one end that goes against the steel rod that holds the idler wheels. Moving A21 back and forth sets the tension for the tracks. This is a throwback to Tamiya’s other release of this kit as a motorized one. 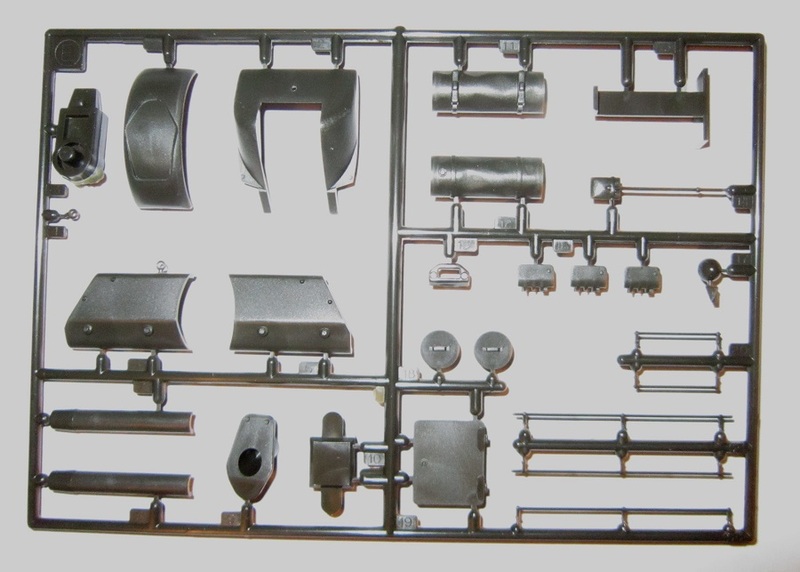 For a static model one would like to have the realistic track sag showing and these parts will be redundant. The inside of the hull bottom has raised marks showing two batteries and there are motorization holes in the bottom of it that will need to be puttied up. This is a fairly decent kit for being close to 30 years ago. It has been re-released as said above which includes a weathering set. However, the box art is identical and the parts most likely are too. I purchased my kit back then at my local hobby shop very cheaply.